I don’t want to own anything until I find a place where me and things go together. I’m not sure where that is but I know what it is like. It’s like Tiffany’s. The song plays softly in the background of this Audrey Hepburn film that I’ve been wanting to see on the big screen for a long time. I haven’t seen it before and I refuse to see it on Netflix. There’s nothing particular about this night. It’s cold and almost starless. We huddle up in our blankets and sip on our coffees as we watch this classic on the outside movie screen. 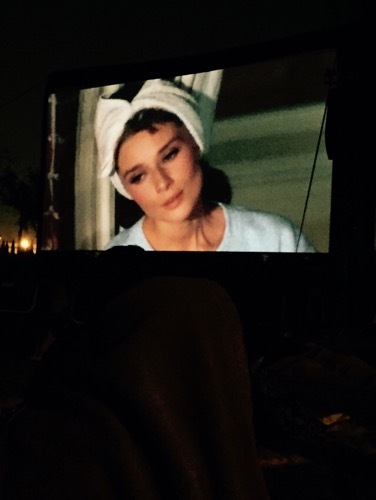 Holly Golightly is funny and witty and “really phony.” I love her. It’s a cold and almost gloomy night but there’s a reason why my heart feels warm as I watch. The song reminds me of my paternal grandma. She used to hum this song… and I miss her. It’s a lovely song, and an enjoyable early 60s romance film too, though pretty sanitized compared to the book. You could check it out free from your Public Library.